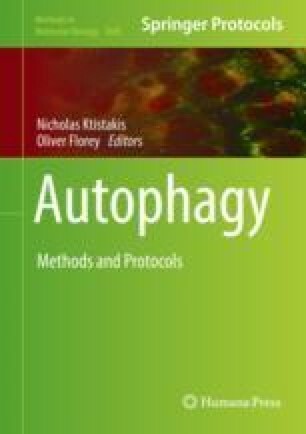 The mammalian ATG8 proteins (LC3A-C/GABARAP, GABARAPL1, and GABARAPL2) are small ubiquitin-like proteins critically involved in macroautophagy. Their processed C-termini are posttranslationally conjugated to a phosphatidylethanolamine moiety, enabling their insertion into the lipid bilayers of both the inner and outer membranes of the forming autophagosomes. The ATG8s bind a diverse selection of proteins including cargo receptors for selective autophagy, members of the core autophagy machinery, and other proteins involved in formation, transport, and maturation (fusion to lysosomes) of autophagosomes. Protein binding to the ATG8s is in most cases mediated by short, conserved sequence motifs known as LC3-interacting regions (LIRs). Here, we present a protocol for identifying putative LIR motifs in a whole protein sequence using peptide arrays generated by SPOT synthesis on nitrocellulose membranes. The use of two-dimensional peptide arrays allows for further identification of specific residues critical for LIR binding. We are extremely grateful to Ola Rumohr Blingsmo at the Centre for Molecular Medicine Norway, NCMM-Administration and Core Facilities (NCMM ADMIN), Faculty of Medicine, University of Oslo, for advice and synthesizing the peptide arrays. The technical assistance of Gry Evjen is greatly appreciated. This work was funded by grants from the FRIBIO and FRIBIOMED programs of the Norwegian Research Council (grant numbers 196898 and 214448) and the Norwegian Cancer Society (grant number 71043-PR-2006-0320) to T.J.